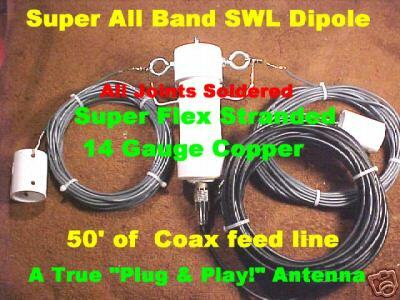 Up for bid is the new, All Band Shortwave Wave Dipole Antenna. Adapted for the common Shortwave Listener, by one of the most trusted names on Ebay, "Lowbander," this antenna has been cut, tuned and tested, by an experienced ham radio operator with 46 years experience. This DXCC Honor Roll Member, with an FCC Amateur Extra Class License, knows DX and antennas! Lowbander now brings another proven performer to the shortwave listeners of the world! Using a simple but proven design, a full size All Band Dipole, one that ham radio ops have used for decades, this antenna is designed and handcrafted for use on all the shortwave bands, and operates very effectively on frequencies from the MW broadcast band all the way up to 30 MHZ!!. It is rugged and should be able to withstand just about any weather extreme. Made of pure, 14 gauge, super flex, stranded insulated copper wire(color of insulation may vary), it was cut and tuned to be resonant on 41Meters, which means over 66 feet of capture area to pull in those weak signals from the sky. No lossey baluns or line transformers are needed with this antenna! Since the antenna is resonant , or a perfect 1:1 SWR on approximately 7 MHZ. , the antenna is a perfect match for the 50 feet of quality coax included in the auction. It has been tested on the MFJ-259B Antenna Analyzer for resonance. The Super Shortwave Dipole will show clear directivity and receive best at right angles off the line of the antenna. In other words, it will receive best broadside to the antenna. From 10 MHZ on up, the antenna will operate as a Full wavelength antenna and will show signs of directivity at angles off the ends of the antenna, somewhat like a true longwire antenna. All the buyer has to do is stretch it out and connect the coax feedline to the radio. All connections have been carefully soldered and the center insulator has been weather proofed for years of reliable service! The rugged design and hardware are not going to break or blow down in the wind under normal operating conditions. Heavy, zinc coated steel hardware is used throughout the construction. There is even a hook or eye bolt on top of the center insulator to support the antenna in the middle if it is used as a sloper or inverted-Vee configuration! The new Super Dipole Shortwave Antenna will work with almost any radio in almost any situation! Sony, Realistic, Sangean, Drake, Icom or Grundig, it really doesn’t matter, because all these great brands of radios work equally well with the Super Dipole. Even radios that don't have coax sockets can use this antenna with a simple adapter plug available at any Radio Shack! The Super Dipole Shortwave Antenna can be configured in dozens of ways and can be deployed to fit the unique situation at your home location. A few tips on installation will come with the antenna, but it is really a "No-Brainer", a true “Plug and Play!” Attach some nylon rope or wire on the end insulators and stretch it out between two supports. The old antenna adage "Install as High as Possible" applies for best performance, but adaptations for your unique situation is a common practice. Hams have even been known to bend the ends of a dipole to get it to fit their yard or supports with very little deterioration of performance. You can count on anything sold by Lowbander to be quality! Price :$39.99 plus $9 shipping.